Up for sale we have a 1976 Pontiac Trans AM. This is a factory 455, Four Speed, Starlight Black car that comes with the some original documentation. The body is rock solid with good fit of the panels. Everything is covered in the Starlight Black Paint that has a deep rich shine and is smooth to the touch. 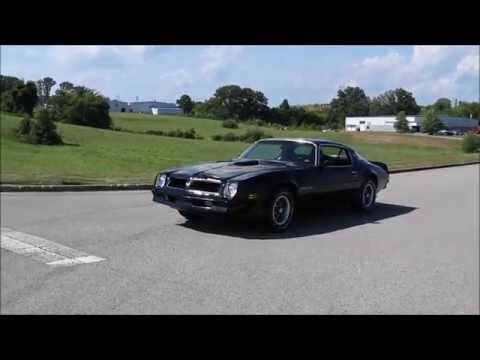 This being a Trans AM it has the Bird on the hood and the T/A Logo on the rear spoiler. Also, it has the wheel flairs and the Shaker Hood. At the time of the repaint they installed new weather stripping and trim. To finish off the look it's sitting on a set of 15” Factory Rally Wheels with rings and caps along with White Letter Tires. On the inside it's all done in black with the correct buckets and console with what appears to be correct shifter. The back seat has the rear seat console option. The seats, carpet, and headliner appear to have been replaced at some point. When you look at the dash it looks all stock with the factory AM FM 8 Track player. There is a small crack in the dash pad, but other than that it looks great. Under the hood it all looks correct with the inner fenders being painted in the Satin Black. The engine is a date code correct 455 V8 that we were told has been built. The intake was changed to an Edelbrock Aluminum with the stock carb. Also, the exhaust has been upgraded with Shorty Headers and a Flow Master Exhaust. The trans is a Muncie Four Speed that's mated to the stock style rear end. This Trans Am comes with Power Steering and Power Brakes with disc upfront. It is a factory AC car that's not working. When you look under it you'll see the stock floors that are still done in the red oxide.